For other uses, see Mauna Loa (disambiguation). Mauna Loa as seen from the air. Hualālai is visible in the background. Mauna Loa ( /ˌmɔːnə ˈloʊ.ə/ or /ˌmaʊnə ˈloʊ.ə/; Hawaiian: [ˈmɐwnə ˈlowə]; English: Long Mountain ) is one of five volcanoes that form the Island of Hawaii in the U.S. state of Hawaiʻi in the Pacific Ocean. The largest subaerial volcano in both mass and volume, Mauna Loa has historically been considered the largest volcano on Earth, dwarfed only by Tamu Massif. It is an active shield volcano with relatively gentle slopes, with a volume estimated at approximately 18,000 cubic miles (75,000 km3),  although its peak is about 125 feet (38 m) lower than that of its neighbor, Mauna Kea. Lava eruptions from Mauna Loa are silica-poor and very fluid, and they tend to be non-explosive. Mauna Loa has probably been erupting for at least 700,000 years, and may have emerged above sea level about 400,000 years ago. The oldest-known dated rocks are not older than 200,000 years. The volcano's magma comes from the Hawaii hotspot, which has been responsible for the creation of the Hawaiian island chain over tens of millions of years. The slow drift of the Pacific Plate will eventually carry Mauna Loa away from the hotspot within 500,000 to one million years from now, at which point it will become extinct. Mauna Loa's most recent eruption occurred from March 24 to April 15, 1984. No recent eruptions of the volcano have caused fatalities, but eruptions in 1926 and 1950 destroyed villages, and the city of Hilo is partly built on lava flows from the late 19th century. Because of the potential hazards it poses to population centers, Mauna Loa is part of the Decade Volcanoes program, which encourages studies of the world's most dangerous volcanoes. Mauna Loa has been monitored intensively by the Hawaiian Volcano Observatory since 1912. Observations of the atmosphere are undertaken at the Mauna Loa Observatory, and of the Sun at the Mauna Loa Solar Observatory, both located near the mountain's summit. Hawaii Volcanoes National Park covers the summit and the southeastern flank of the volcano, and also incorporates Kīlauea, a separate volcano. Mauna Loa's summit, overlaid with 100 m (328 ft) contour lines; its rift zones are visible from the air. Mokuʻāweoweo, Mauna Loa's summit caldera, covered in snow. A view of Mauna Loa taken from a Pu'u near The Onizuka Center for International Astronomy Visitor Information Station at the 9300 ft. level of Mauna Kea. Clickable imagemap of the United States Geological Survey hazard mapping for Hawaii island; the lowest numbers correspond with the highest hazard levels. Mauna Loa has not erupted since, and as of May 2018, the volcano has remained quiet for nearly 34 years, its longest period of quiet in recorded history. Although not counting the minor activity in 1975, Mauna Loa was inactive for a 34-year period between 1950 and 1984. Its recent inactivity is most likely not long-term, as even a century of low activity is a very short period in Mauna Loa's several hundred-thousand year history. Mauna Loa is one of the 16 Decade Volcanoes. GPS stations, tiltmeters, and strainmeters on Mauna Loa's summit. Not shown: a webcam and a gas detector positioned on the caldera rim. Summit inflation as measured via GPS between June 2004 and April 2005; arrows denote between 1 and 10 cm (0.4 and 3.9 in) of growth. The Scottish botanist and naturalist Archibald Menzies was the first European to reach the summit of Mauna Loa, on his third attempt. Wilkes sailed to Hilo on the island of Hawaiʻi and decided to climb Mauna Loa first, since it looked easier than Mauna Kea. On December 14 he hired about 200 porters, but after he left he realized only about half the equipment had been taken, so he had to hire more Hawaiians at higher pay. When they reached Kīlauea after two days, their guide Puhano headed off to the established ʻAinapō Trail. Wilkes did not want to head back downhill so he blazed his own way through dense forest directed by a compass. The Hawaiians were offended by the waste of sacred trees which did not help morale. At about 6,000 feet (1,800 m) elevation they established a camp called "Sunday Station" at the edge of the forest. Two guides joined them at Sunday Station: Keaweehu, "the bird-catcher" and another whose Hawaiian name is not recorded, called "ragsdale". Although Wilkes thought he was almost to the summit, the guides knew they were less than halfway up. Since there was no water at Sunday Station, porters had to be sent back ten miles (16 km) to a lava tube on ʻAinapō Trail which had a known supply. After an entire day replenishing stocks, they continued up to a second camp they called "Recruiting Station" at about 9,000 feet (2,700 m) elevation. After another full day's hike they established "Flag Station" on December 22, and by this time were on the ʻAinapō Trail. Most of the porters were sent back down to get another load. On December 31, 1840 the pre-fabricated pendulum house was assembled. Axes and chisels cut away the rock surface for the pendulum's base. It took another three days to adjust the clock to the point where the experiments could begin. However, the high winds made so much noise that the ticks could often not be heard, and varied the temperature to make measurements inaccurate. Grass had to be painstakingly brought from the lowest elevations for insulation to get accurate measurements. 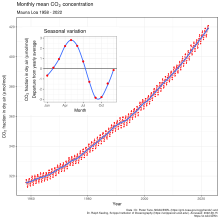 Atmospheric CO2 concentrations measured at the Mauna Loa Observatory. ^ a b c "Mauna Loa, Hawaii". Peakbagger.com. Retrieved 12 December 2012. ^ a b c d e f g "Mauna Loa: Earth's Largest Volcano". Hawaiian Volcano Observatory – United States Geological Service. 2 February 2006. Retrieved 9 December 2012. ^ "Mauna Loa: Earth's Largest Volcano". USGS. 2 February 2006. Retrieved 21 October 2015. ^ Kaye, G.D. (2002). Using GIS to estimate the total volume of Mauna Loa Volcano, Hawaii. Geological Society of America. 98th Annual Meeting. ^ a b "Mauna Kea". NGS Station Datasheet. 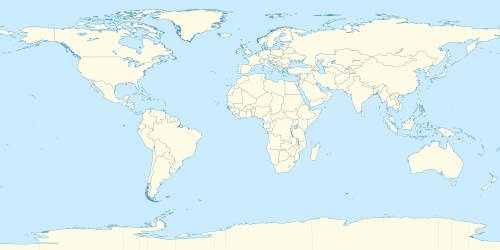 United States National Geodetic Survey. Retrieved February 15, 2019. ^ "Mauna Loa: Earth's Largest Volcano". United States Geological Survey. February 2, 2006. Retrieved 2007-07-28. ^ a b c d David R. Sherrod; John M. Sinton; Sarah E. Watkins & Kelly M. Brunt (2007). "Geologic Map of the State of Hawai'i" (PDF). Open-File Report 2007–1089. United States Geological Survey. pp. 50–51. Retrieved 9 December 2012. ^ a b Watson, Jim (May 5, 1999). "The long trail of the Hawaiian hotspot". United States Geological Survey. Retrieved August 26, 2010. ^ Clague, David A.; Dalrymple, G. Brent (1987). "The Hawaiian-Emperor Volcanic Chain – Geological Evolution" (PDF). Volcanism in Hawaii: papers to commemorate the 75th anniversary of the founding of the Hawaii Volcano Observatory. Professional Paper 1350. 1. United States Geological Survey. p. 32. Archived from the original (PDF) on 2012-10-10. ^ a b c "Kīlauea – Perhaps the World's Most Active Volcano". Hawaiian Volcano Observatory – United States Geological Survey. 7 May 2009. Retrieved 27 January 2012. ^ "Kohala – Hawaii's Oldest Volcano". Hawaiian Volcano Observatory – United States Geological Survey. 20 March 1998. Retrieved 29 January 2012. ^ "Lo'ihi Seamount Hawai'i's Youngest Submarine Volcano". Hawaiian Volcano Observatory – United States Geological Survey. 26 March 2000. Retrieved 30 January 2012. ^ W. J. Kious & R. I. Tilling (1996). "Hotspots": Mantle thermal plumes (1.14 ed.). United States Geological Survey. ISBN 978-0-16-048220-5. Retrieved 9 December 2012. ^ "Evolution of Hawaiian Volcanoes". Hawaiian Volcano Observatory – United States Geological Survey. 26 March 1998. Retrieved 30 January 2012. ^ Brian Clark Howard (2013-09-05). "New Giant Volcano Below Sea Is Largest in the World". National Geographic. ^ a b c d G. MacDonald & D. Hubbard (24 March 2006) [1951, 7th ed. revision December, 1974]. "Mauna Loa, Fiery Colossus of the Pacific". National Park Service. Archived from the original on 20 October 2013. Retrieved 9 December 2012. ^ Rubin, Ken; Minicola, Rochelle (20 March 2009). "Mauna Loa Volcano". Hawaiian Volcano Observatory – United States Geological Survey. Retrieved 12 December 2012. ^ Navin Singh Khadka (28 February 2012). "Nepal in new bid to finally settle Mount Everest height". BBC News. Retrieved 10 December 2012. ^ J.G. Moore (1987). "Subsidence of the Hawaiian Ridge". Volcanism in Hawaii: Geological Survey Professional Paper. 1350 (1). ^ "How High is Mauna Loa?". Hawaiian Volcano Observatory – United States Geological Survey. 20 August 1998. Retrieved 5 February 2013. ^ Claude Herzberg (30 November 2006). "Petrology and thermal structure of the Hawaiian plume from Mauna Kea volcano". Nature. Nature Publishing Group. 444 (7119): 605–09. Bibcode: 2006Natur.444..605H. doi: 10.1038/nature05254. PMID 17136091. Retrieved 10 December 2012. ^ a b "When did Moku'aweoweo (the summit caldera of Mauna Loa) form?". Hawaiian Volcano Observatory – United States Geological Survey. 28 March 2001. Retrieved 11 December 2012. ^ a b c Peter W. Lipman (1980). "The Southwestern Rift Zone of Mauna Kea: Implications for Structural Evolution of Hawaiian Volcanoes". American Journal of Science. American Journal of Science. 280-A: 752–76. ^ "What's up with Mauna Loa?". Hawaiian Volcano Observatory – United States Geological Survey. 23 October 2001. Retrieved 16 December 2012. ^ a b E. W. Wolfe; W. S. Wise; G. B. Dalrymple (1997). The geology and petrology of Mauna Kea volcano, Hawaii : a study of postshield volcanism. Professional Paper 1557. United States Geological Survey. Retrieved 12 December 2012. ^ E. C. Cannon & R. R. Bürgmann (26 October 2009). "Complete Report for Mauna Kea Volcano (Class B) No. 2601". United States Geological Survey. Archived from the original on 16 February 2012. Retrieved 12 December 2012. ^ "Rift Zones". Oregon State University. Retrieved 13 December 2012. ^ "Inflation of Mauna Loa Volcano slows". Volcano Watch. Hawaiian Volcano Observatory – United States Geological Survey. 28 January 2003. Retrieved 30 January 2012. ^ a b Ken Hon. "Giant Landslides: Kilauea and Mauna Loa: GEOL 205: Lecture Notes". University of Hawaii at Hilo. Retrieved 16 December 2012. ^ "Glaciers on Mauna Kea? You crazy? In the middle of the Pacific? YES!". Hawaiian Volcano Observatory – United States Geological Survey. 22 October 2007. Retrieved 16 December 2012. ^ a b c "Eruption History". Hawaiian Volcano Observatory – United States Geological Survey. 2 February 2006. Retrieved 16 December 2012. ^ a b c d e f g Rubin, Ken; Minicola, Rochelle (7 March 2007). "Mauna Loa Eruption History". Hawaii Center for Volcanology. Retrieved 12 December 2012. ^ "Eruption History: A Cyclic Eruption Model is Proposed". HVO. 16 March 1998. Retrieved 25 December 2012. ^ Lockwood J.P. (1995), "Mauna Loa eruptive history – the preliminary radiocarbon record", in Rhodes, J.M. and Lockwood, J.P. (eds. ), Mauna Loa revealed: structure, composition, history, and hazards, Washington D.C., American Geophysical Union Monograph 92, pp. 81–94. ^ "Eruption History of Mauna Loa Volcano". United States Geological Survey, Hawaiian Volcano Observatory. Retrieved 2007-07-28. ^ "Eruption History: A Cyclic Eruption Model is Proposed". United States Geological Survey, Hawaiian Volcano Observatory. March 16, 1998. Retrieved 28 July 2007. ^ a b c d e f g h i "Summary of Historical Eruptions, 1843–Present". Hawaiian Volcano Observatory – United States Geological Survey. 17 September 2004. Retrieved 24 January 2013. ^ "Mauna Loa: Eruptive History". Global Volcanism Program. Smithsonian National Museum of Natural History. Retrieved 24 January 2013. ^ a b John Seach. "Mauno Loa Volcano – John Seach". Retrieved 24 January 2013. ^ a b Russell A. Apple. "Mauna Loa". Hawaiian Volcano Observatory – United States Geological Survey. Retrieved 26 January 2013. ^ a b c d e f g h John Watson (18 July 1997). "Lava Flow Hazard Zone Maps: Mauna Loa". United States Geological Survey. Archived from the original on 15 January 2013. Retrieved 12 December 2012. ^ "The Great Ka'u Earthquake of 1868". Hawaiian Volcano Observatory – United States Geological Survey. 26 March 1998. Retrieved 24 January 2013. ^ "Eruptions of Hawaiian Volcanoes". United States Geological Survey. 5 January 1997. Retrieved 24 January 2013. ^ a b c "50th Anniversary of Mauna Loa's Most Spectacular Eruption". Hawaiian Volcano Observatory – United States Geological Survey. 17 September 2004. Retrieved 24 January 2013. ^ a b "The Mauna Loa Eruption of 1926". Hawaiian Volcano Observatory – United States Geological Survey. 26 March 1998. Retrieved 26 January 2013. ^ "Lava diversion in Hawai'i?". Hawaiian Volcano Observatory – United States Geological Survey. Retrieved 24 January 2013. ^ "Shhh! Don't tell there is an eruption – Eruption of 1942". Hawaiian Volcano Observatory – United States Geological Survey. 27 April 1998. Retrieved 24 January 2013. ^ "The 1950 eruption of Mauna Loa: a nightmare that could reoccur". Hawaiian Volcano Observatory – United States Geological Survey. May 14, 2001. Retrieved 24 January 2013. ^ "The Mauna Loa Eruption of 1984". Hawaiian Volcano Observatory – United States Geological Survey. 26 March 1998. Retrieved 24 January 2013. ^ "1984 Eruption: March 25 – April 15". Hawaiian Volcano Observatory – United States Geological Survey. 17 September 2004. Retrieved 24 January 2013. ^ Gordon A. MacDonald; Douglass H. Hubbard (24 March 2006). "Volcanoes of the National Parks of Hawaii". National Park Service. Retrieved 24 January 2013. ^ International Association of Volcanology and Chemistry of the Earth's Interior (1998). "Decade Volcanoes". Cascades Volcano Observatory. United States Geological Survey. Retrieved 25 January 2013. ^ Nick Varley. "Decade Volcano Program IDNDR – IAVCEI – 1990/2000". Société Volcanologique Européenne. Retrieved 25 January 2013. ^ John Watson (18 July 1997). "Volcanic and seismic hazards on the island of Hawaii". United States Geological Survey. Retrieved 25 January 2013. ^ "How Volcanoes Work: Hawaiian Eruptions". San Diego State University. Retrieved 25 January 2013. ^ "Lava flow hazards on Mauna Loa volcano". Hawaiian Volcano Observatory – United States Geological Survey. 2 February 2006. Retrieved 25 January 2013. ^ Robert and Barbara Decker (1997). Volcanoes (3rd ed.). New York: W.H. Freeman & Co, Ltd. ISBN 978-0-7167-3174-0. ^ Cannon, Eric C.; Bürgmann, Roland; Owen, Susan E. (2001). "Shallow Normal Faulting and Block Rotation Associated with the 1975 Kalapana Earthquake, Kilauea'". Bulletin of the Seismological Society of America. Seismological Society of America. 91 (6): 1553. Bibcode: 2001BuSSA..91.1553C. doi: 10.1785/0120000072. ^ Russell A. Apple (4 January 2005). "Thomas A. Jaggar, Jr., and the Hawaiian Volcano Observatory". Hawaiian Volcano Observatory – United States Geological Survey. Retrieved 26 January 2013. ^ "HVO Seismic Network". Hawaiian Volcano Observatory – United States Geological Survey. 18 June 2001. Retrieved 26 January 2013. ^ a b "Long-term Monitoring Data". Hawaiian Volcano Observatory – United States Geological Survey. Retrieved 26 January 2013. ^ "Mauna Loa Volcano, Hawai'i : Current Monitoring". Hawaiian Volcano Observatory – United States Geological Survey. Retrieved 26 January 2013. ^ "Final Environmental Statement for the Outrigger Telescopes Project: Volume II" (PDF). NASA. February 2005. p. C–9. Archived from the original (PDF) on 21 April 2009. Retrieved 4 September 2012. ^ "Culture: The First Arrivals: Native Hawaiian Uses" (PDF). Mauna Kea Mountain Reserve Master Plan. University of Hawaii. Archived from the original (PDF) on 8 November 2012. Retrieved 2 September 2012. ^ Kirch, Patrick V. (January 1982). "The Impact of the Prehistoric Polynesians on the Hawaiian Ecosystem". Pacific Science. University of Hawai’i Press. 36 (1): 1–14. Retrieved 2 September 2012. ^ Athens, Stephen; Tuggle, H. David; Ward, Jerome V.; Welch, David J. (2002). "Avifaunal Extinctions, Vegetation Change and Polynesian Impacts in Prehistoric Hawai'i". Archaeology in Oceania. 37 (2): 57. doi: 10.1002/j.1834-4453.2002.tb00507.x. Retrieved 4 September 2012. ^ Caitlin Kelly. "Information on the Mauna Loa Volcano in Hawaii". USA Today. Retrieved 27 January 2013. ^ Ken Hon. "Hawaiian Oral History related to Geology". University of Hawaii at Hilo. Retrieved 27 January 2013. ^ Various authors (1987). R. W. Decker; et al. (eds.). Volcanism in Hawaii: papers to commemorate the 75th anniversary of the founding of the Hawaii Volcano Observatory (PDF). United States Geological Survey Professional Paper, 1350. 1. United States Geological Survey. Archived from the original (PDF) on 10 October 2012. Retrieved 2 September 2012. ^ a b Russell A. Apple (20 August 1974). "National Register Of Historic Places Inventory – Nomination Form for Federal Properties – Ainapo Trail" (PDF). National Park Service. Archived from the original (PDF) on 29 September 2012. Retrieved 27 January 2013. ^ Rick Warshauer (October 2005). "The Proposed Mauka Trails System: The Roles and History of Trails on the Big Island". The Nature Conservancy. Retrieved 27 January 2013. ^ a b c d e Walther M. Barnard (1991). "Earliest Ascents of Mauna Loa Volcano, Hawai'i" (PDF). Hawaiian Journal of History. Hawaiian Historical Society, Honolulu. 25. hdl: 10524/599. ^ a b c d e Roberta A. Sprague (1991). "Measuring the Mountain: the United States Exploring Expedition on Mauna Loa, 1840–1841" (PDF). Hawaiian Journal of History. Hawaiian Historical Society. 25. hdl: 10524/359. ^ Charles Wilkes (1849). Narrative of the United States Exploring Expedition. Volume IV. G. P. Putnam. p. Pages 111–162. ^ a b c Russell A. Apple (1973). "Wilkes Campsite Nomination form". National Register of Historic Places. National Park Service. ^ "NOAA Mauna Loa Observatory". National Oceanic and Atmospheric Administration web site. Retrieved 2009-07-04. ^ Rubin, Ken; Minicola, Rochelle (2004). "Mauna Loa Flora and Climate". Hawaii Center for Volcanology. Retrieved 2007-07-28. ^ "Period of Record General Climate Summary – Temperature". MAUNA LOA SLOPE OBS, HAWAII. NOAA. Retrieved 2012-06-05. ^ "Period of Record Monthly Climate Summary". MAUNA LOA SLOPE OBS, HAWAII. NOAA. Retrieved 2012-06-05. ^ "The Yuan Tseh Lee Array for Microwave Background Anisotropy (AMiBA)". ASIAA. May 12, 2012. Retrieved July 26, 2013. 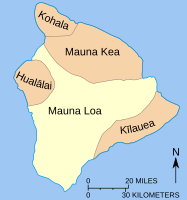 Wikimedia Commons has media related to Mauna Loa.